This two layer Pumpkin Butter Cake will be a new Fall favorite. 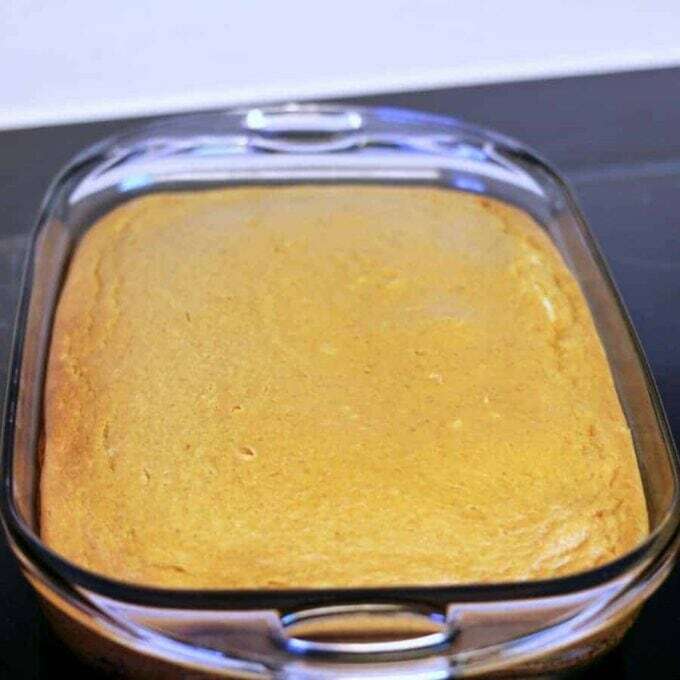 It’s buttery cake layer bottom is moist and delicious and topped with a creamy layer of pumpkin puree, cinnamon, cream cheese, powdered sugar, nutmeg and ginger. All blended together and topped with whipped cream to make this delicious Fall Dessert. We love pumpkin recipes! Some of our favorites are our Chocolate Chip Pumpkin Bread and our Pumpkin Spice Chex Mix. It’s that time of year when the colors start to change and we all start thinking about apple and pumpkin recipes. Fall recipes are not only warm and delicious to eat, they also can make your house smell amazing. There is nothing like those cinnamon and nutmeg smells that fill your house when you are baking yummy fall desserts! 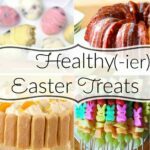 I’m Mary Ellen and I blog over at Recipes Food and Cooking. I decided to start the Fall out right with a new Ooey Gooey Butter Cake this time made with pumpkin. I hope you love it as much as we did. 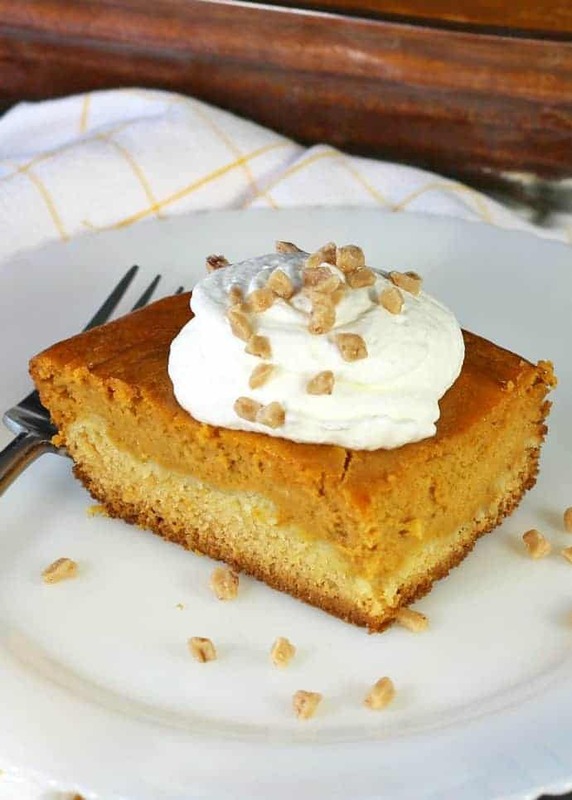 The great thing about this Pumpkin Butter Cake recipe is that it is so easy to make! Topped off with whipped cream and toffee bits! You can put this together in less than 15 minutes and it bakes in a little over an hour depending on your oven. This kind of cake is better at room temperature and it does need to be refrigerated. Be sure to take it out of the refrigerator at least 30 minutes before serving. Sometimes because of the long baking times of these cakes I get lots of questions about them. I start checking them at about 50 minutes into the baking time. This one baked for 1 hour and 10 minutes in my oven. All ovens are different and baking times can be different from one oven to another. A tester (like a toothpick) will pull out clean when it is done. It will also be slightly puffed in the center. Here is a pic of when mine came out of the oven. They tend to also fall a bit in the center as they cool. One thing that can help keep any kind of cake like this level is to use Wilton Bake Strips. This helps with high-rise centers, cracked tops and over-cooked cake edges. To use them just wet them and wrap them around the outside of the pan. 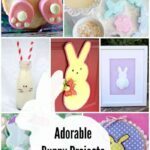 I love using them and they will make a difference in baking cakes if you use them. Today I forgot to use them until I got this cake in the oven so this cake was baked without them. It looks level now because it just came out of the oven but it will fall in the center slightly as it cools. This two layer Pumpkin Butter Cake will be a new Fall favorite. 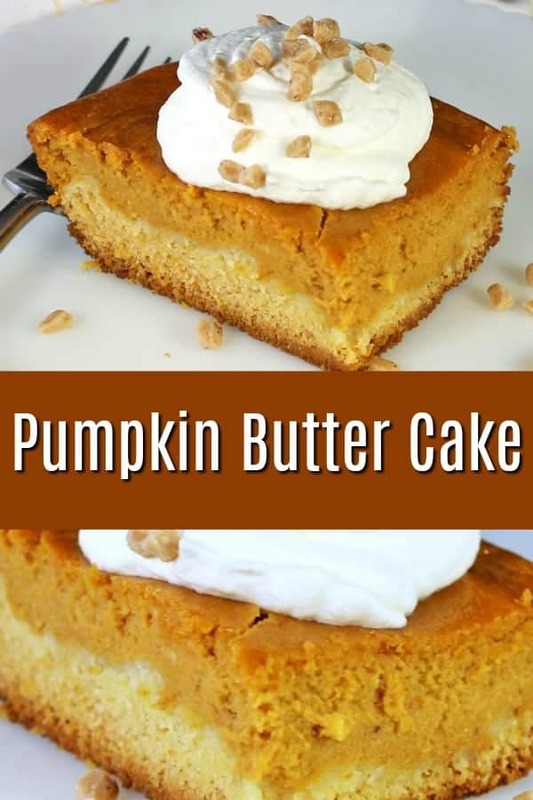 It's buttery cake layer bottom is moist and delicious and topped with a creamy layer of pumpkin puree, cinnamon, cream cheese, powdered sugar, nutmeg and ginger. All blended together and topped with whipped cream to make this delicious Fall Dessert. Put the cake mix, butter, egg and water in a mixing bowl. Beat until thoroughly mixed. Spread on the bottom of a 9 x 12 pan. Put all of the topping ingredients in a mixer bowl. Mix until everything is thoroughly combined. Pour over the cake layer. Bake for about 60 minutes. Mixture will be puffed in the center when done and a cake tester or toothpick will pull out clean. Whip the heavy cream with the vanilla and sugar until soft peaks form. Top cake and then sprinkle on a few toffee bits or Fall colored sprinkles or jimmies. Mary Ellen loves to cook and bake and learned to cook watching her grandmother, mom and aunts in her grandmother’s busy kitchen. It was a magical place where it seemed as if the pot never emptied and there was always room at the table for one more. It seems only natural that she would love to cook and bake so much. She worked in her uncle’s restaurant all through school and continued on a culinary path for about 15 years including being a pastry chef. She even owned a bakery for a short time. I make a very similar pumpkin gooey cake and totally agree. 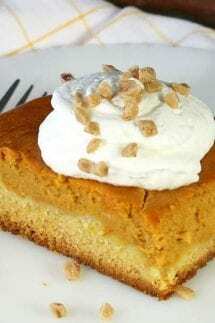 It is the best pumpkin dessert. I hope you readers will definitely give this cake a try very soon. Sharing so everyone can see what they are missing.